WASHINGTON — A representative of the Russian developer who partnered with President Donald Trump to bring the Miss Universe pageant to Moscow was the eighth person at a Trump Tower meeting arranged by Donald Trump Jr. during the campaign, a lawyer for the developer said Tuesday. Ike Kaveladze attended to help translate at the meeting with Trump Jr., Russian lawyer Natalia Veselnitskaya and others, attorney Scott Balber told The Washington Post and CNN. Balber told the outlets that Kaveladze works for developers Emin and Aras Agalarov and was there to represent them. The father and son worked with Trump on the pageant in 2013. They were named in the emails that set up the Trump Tower meeting, which promised damaging information on Hillary Clinton. Balber didn’t return messages from The Associated Press seeking comment. He told the other media outlets that officials from Special Counsel Robert Mueller’s office were in touch with him about Kaveladze and that he and Kaveladze were cooperating. A person familiar with the meeting speaking on condition of anonymity because of the sensitivity of the investigation confirmed to the AP that Kaveladze attended. Mueller is investigating possible ties between the Trump campaign and Russia during the 2016 presidential election. 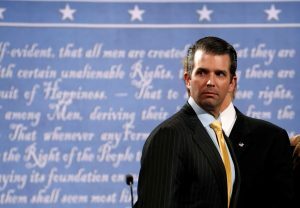 Trump’s eldest son arranged the June 2016 meeting after he was promised that a Russian government lawyer would provide negative information about Trump’s Democratic rival during the campaign. In emails, Trump Jr. expressed enthusiastic support at the prospect of receiving such material. Balber said Kaveladze wasn’t needed as a translator at the meeting because Veselnitskaya brought one with her. The meeting also was attended by Trump son-in-law Jared Kushner, then-campaign chairman Paul Manafort and Rinat Akhmetshin, a prominent Russian-American lobbyist and a former Soviet military officer. Trump Jr. scheduled the gathering after a British publicist for Emin Agalarov promised that Veselnitskaya might have damaging information on Clinton she could share at the meeting. Trump Jr. has said the information wasn’t useful. Vaselnitskaya has denied that she works for the Russian government. She says the meeting focused on US-Russian adoption policies and a sanctions law. Associated Press writer Desmond Butler in Baltimore contributed to this report. Left: A representative of the Russian developer who partnered with President Donald Trump to bring the Miss Universe pageant to Moscow was the eighth person at a Trump Tower meeting arranged by Donald Trump Jr. during the campaign, a lawyer for the developer said Tuesday. File photo by REUTERS/Brian Snyder.